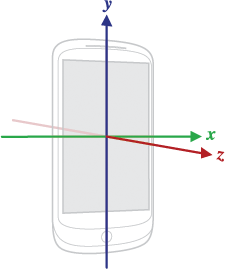 The accelerometer measures the acceleration applied to the sensor built-in into the device, including the force of gravity. In other words, the force of gravity is always influencing the measured acceleration, thus when the device is sitting on a table, the accelerometer reads the acceleration of gravity: 9.81 m/s². 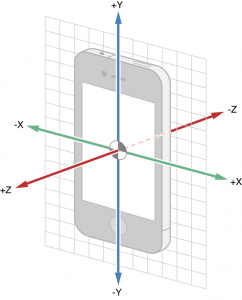 Similarly, if the phone is in free-fall towards the ground, the accelerometer reads: 0 m/s². Accelerometer.getFrequency( Context context ): returns sampling rate in Hz. Aware_Preferences.STATUS_ACCELEROMETER: true or false to activate or deactivate accelerometer sensor. Aware_Preferences.FREQUENCY_ACCELEROMETER: non-deterministic frequency in microseconds (dependent of the hardware sensor capabilities and resources), e.g., 200000 (normal), 60000 (UI), 20000 (game), 0 (fastest). Accelerometer.ACTION_AWARE_ACCELEROMETER: new data recorded in provider. Accelerometer.EXTRA_DATA: the recorded data, as ContentValues. Accelerometer.ACTION_AWARE_ACCELEROMETER_LABEL: send this broadcast to assign a label to the ongoing recording of data. The accelerometer measures velocity over time along three axes, as shown in Figure. A G is a unit of gravitation force equal to that exerted by the earth’s gravitational field (9.81 m s−2). ACTION_AWARE_ACCELEROMETER: new data recorded in provider. EXTRA_DATA: the recorded data, as ContentValues.